So, the other Sarah Burton got to design a few dresses and such for the Duchess of Cambridge last year (just google if you are among the 1% that didn't watch the wedding last April). As the Creative Director over at Alexander McQueen, that SB is just a tad more well known. Again, just google and you'll see the fist 1,049,253 links point to her instead of anything related to Verdigris Knits. But this week, this SB got to knit for one of the most famous mascots in America - Butler Blue II - the mascot for the Butler Bulldogs. Here is Blue II rocking his 2012 Super Scarf. He's been quite in demand for appearances this week in the Super Bowl Village. And he is one deserving volunteer - he has been a tireless volunteer not only for Butler, but for the entire city of Indianapolis, spreading joy and spirit to all of us. 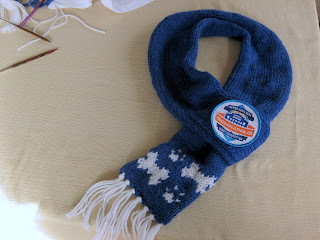 Here's the scarf. Knit in the round in stockinette with short row shaping around the neck to help the fit. Stranded bones and paw prints on one end with a bit of fringe. The other end is a self formed loop with the patch sewn on the top. Wow!!! B and P are watching it all and enjoying all involving BBII and Cl1 and all the INDY excitement!! !